EcoTools Sleek + Shine Finisher Hair Brush's unique bristle pattern allows the synthetic boar’s hair-like bristles to penetrate down to the scalp, distributing hair’s natural moisturizers and leaving hair with a sleek, lustrous shine. Useless brush for hair. The bristles are so soft that they don't even reach down to the scalp, and I have thin straight hair! It works great as a back scratcher though and it might be good to exfoliate the skin, but for the hair - USELESS. I love this brush. My hair has never looked better! Wow! I love this brush. People complimented my hair after i bought this brush. My scalp feels great. Best hair brush I've ever bought. 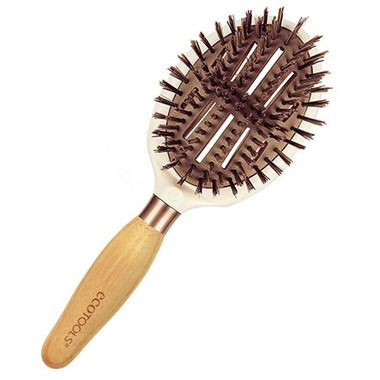 Great for thinner hair - the bristles aren't quite hard enough to reach the scalp on thicker hair. But a great brush, and definitely leaves my hair sleeker and shinier as promised! After trying this brush once, I threw out every other brush I own. It really does leave your hair sleek and shiny.